VANCOUVER, B.C. (October 11, 2017): Imperial Parking Canada Corporation (Impark) announced today the deployment at parking facilities in Vancouver and the Lower Mainland of hangTagTM; a new parking app. HangTag allows parkers to conveniently locate parking facilities on a map, view lot details, get driving directions, and pay for parking without going to the meter. The app also provides an early notification when a session is about to expire, allowing parkers to extend time right from their phone. 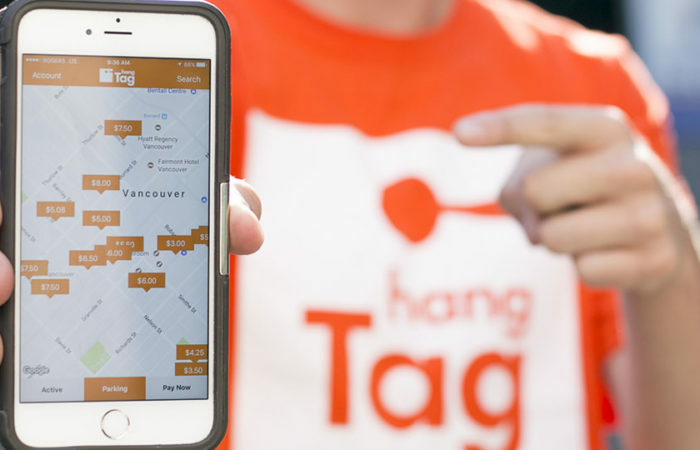 hangTag was first launched in August at Advanced Parking and Metro Parking facilities in Vancouver and Whistler, BC, and with the current deployment of the app throughout many of Impark’s lots, hangTag will offer users a wide variety of parking choices in the Lower Mainland. Impark is also deploying the hangTag app in London, Ontario, in October, and plans include further expansion through Impark’s operations in Canada and the United States. VANCOUVER, B.C. (October 25, 2017): Imperial Parking Canada Corporation (Impark) announced today the deployment at parking facilities in London and Sudbury of hangTag™ , a new parking app. Imperial Parking Canada Corporation (Impark) announced today the deployment at parking facilities throughout Canada of hangTag™, a new parking app.